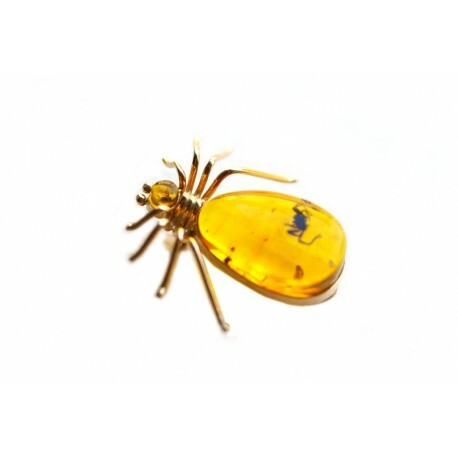 A golden brooch - a spider with two transparent amber inclusions. Amber transparency, like the light from the inside, originally pitched inclusions draw attention. One of them is a million years old inclusion - a spider. Spider - a symbol of happiness. It symbolizes the cosmic order. A smiling spider has become a symbol of all the endangered Hawaiian nature. When arrived to the island, its image can be seen everywhere - starting with T-shirts, baseball caps, ending with stamps and vans. It is also a symbol of female power.